Each time All-American quoted us lower than any other movers in town, and stayed within the quote. Don’t hesitate to use All American Moving & Storage. We were honored to move Columbus’ biggest icon. 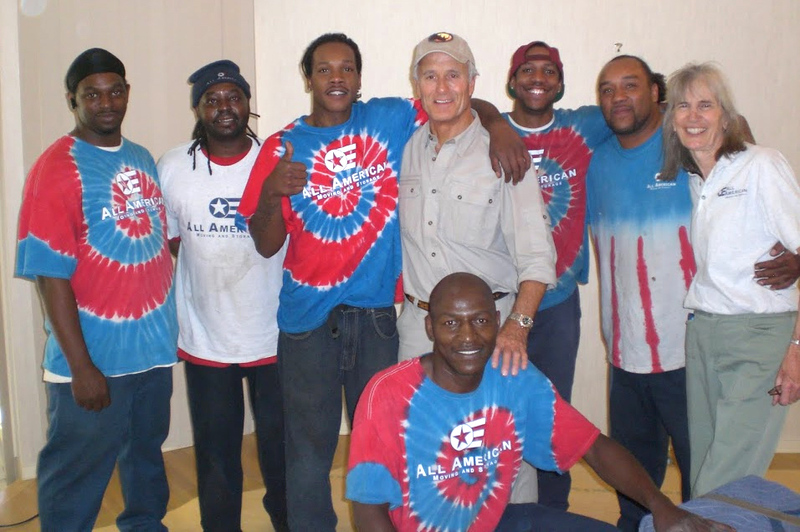 All American Moving has had the privilege of moving some of Columbus’ greatest celebrities – but one we are particularly proud of was when we had the honor of moving “Jungle” Jack Hanna and his family. Jack’s personal assistant picked All American due to our outstanding record with the Better Business Bureau. This move had many phases, and lasted over one month, primarily due to all of the packing involved of all of their collectibles from their years of worldwide travel. We spent so much time with the Hanna’s, we practically felt like family by the time their move was completed. The Hanna’s are the kindest, most thoughtful people you can imagine – they do not have “TV personalities” – they are who they are – the same people you see on TV – real and authentic. This was most definitely one of the all time highlights for All American. We know. The wind was horrible the day we moved Jack Hanna and his family, making some of the audio on this video hard to hear. To help out, here is a transcript of what is being said. Dan Dragin (All American General Manager): I am here with Columbus’ own jungle Jack Hanna and his better half Suzy Hanna and we, all American Moving, just got done relocating them from their home in Muirfield Village to this beautiful farm house here on the Zoo property. Jack and Susie – how did how did everything go with the move? Jack Hanna: Well the move was outstanding from the standpoint that one of the top five stresses in life is to move, especially to have been there for twenty-something years, three daughters—and Sue and I like to keep everything. When you’re talking about 180 boxes, you’re talking about furniture that weighs tons, you’re talking about — I’d say a difficult move, but it may not have been a difficult move but it was long. It really made our lives. It saved our lives. It saved our marriage and everything. Go ahead Sue. Suzy Hanna: As jack said just moving in its self is really stressful and a lot of other things have come up in our live so it really was extra difficult this time. And I have to say I was not looking forward to it but when the guys came to help us move I can’t begin tell you how incredible they were. At the end of the day I almost felt like they were part of our family because they were just so kind, so dear, so patient, and so helpful, and not once did they ever make me feel like I was putting them out and it was extremely difficult because a lot of times the furniture really wasn’t quite working and at which they said you know I don’t think its quite right and they would move things for me so many times and I was worried they would scratch them really badly but they continued and said no, no, no, no, no, don’t you worry it at all I mean..
Jack Hanna: I had them take this thing that weighed a ton upstairs, three times, three times. Suzy Hanna: That’s not an exaggeration. If I ever move again, I’ll call them. I’m 65 now, so if I move again I might be in a time box, but All American, we’ll see you next time. Suzy Hanna: If I may say one last thing. I started out being so stressful today and because of All American Moving and Storage I am totally at peace. I can’t believe it. Jack Hanna: Thank You All American Moving.